“Occasionally, I put on my Surrey Chairman of NAEA hat, and survey the property scene around the whole of our glorious county” says James Wyatt, partner of Barton Wyatt. “The word on the street towards the end of 2013 was generally that everything was ‘OK’. Newspaper headlines shouted of ‘Housing Boom’ and ‘House Prices Rising £1,200 a month’. Headlines like this get the Surrey dinner party set really excited – property chat once again becomes a hot topic. “But, Surrey is the most expensive county in the country outside London, and we’re not in a boom – yet. The property fire needs stoking from the bottom, and this is clearly what is going on elsewhere around the country. The Surrey property market is just out of its starting block and by Easter, we’ll be into a canter. By summer, expect a full gallop and price rises outstripping London (where property price gains must surely be running on an empty tank). With mortgages freely available at low rates, a bit of Government Help2Buy for some, there is a great opportunity this year to get moving. Move soon, and you might see your investment rise by over 10% by Christmas”. Barton Wyatt has a number of new instructions including Trumps Mill House in Virginia Water and Whickham on the Wentworth Estate. Trumps Mill House is the oldest property in Virginia Water, with parts dating back to 1483. It has four bedrooms, formal dining and drawing rooms, kitchen/breakfast room and cellar, storage and workshop on the lower ground floor. Within its 14 acres are landscaped gardens, a mill pond and some magnificent woodland. The house is for sale with a guide price of £1.95 million. Whickham is a recently completed classically styled five bedroom, five bathroom family house in approximately a half an acre. With three reception rooms, study, a contemporary Lida Cucina kitchen/breakfast room, games room which could make a sixth bedroom and staff suite over the double garage, the property is for sale for £4.25 million. “Esher has continued to benefit from the strength of the central London property market with an influx of buyers looking to move out and cash in on the recent price increases. The price range between £500,000 and £2 million has been particularly strong with new instructions seeing strong viewing and offer levels and we see this continuing over the first 6 months of 2014” says Alex Herman, head of Knight Frank’s Esher office. He is marketing Centurion House, which is a wonderful bespoke family residence commissioned by the current owners and built to the highest level of specification. The house, which is on St. George’s Hill, has six bedrooms, six bathrooms and six reception rooms, fabulous landscaped gardens in 1.24 acres, a superb indoor pool complex, gymnasium and magnificent wine cellar. The property is for sale with a guide price of £11.75 million. The Coach House in Esher Park Avenue is a smaller, newly built three bedroom house due to be completed in September this year. With three bathrooms, three reception rooms and a garden it is for sale through Knight Frank with a guide price of £1.75 million. Weybridge too has seen an active start to the year. “The positive media and a general feeling of confidence in the market is encouraging people to move up the property ladder. Many people are seeing this as a moment of opportunity to upsize whilst interest rates remain low and before the gap to move upwards becomes too great to achieve” says Vincent Dennington of John D. Wood’s Weybridge office. He is selling Goodacre Close, a four bedroom, three bathroom townhouse with garden in a small development half a mile from Weybridge station for £825,000 and The Paddocks, a five bedroom family house with around one-third of an acre with a large garden, swimming pool, conservatory and garage, for sale for £1.4 million. John D. Wood’s Leatherhead office is marketing Danes Way in Oxshott. This five bedroom house is situated in the exclusive Danes Court private estate with over 5,000 square feet of accommodation including four reception rooms, a superb kitchen/breakfast room, detached garage with annexe and wonderful rear garden. It is for sale with a guide price of £2.575 million. “New figures released in the final quarter of 2013 illustrated that over the last year, prime property in south-west London increased in price by a record 11.8%, 6.3% more than in central London. This is unsurprising considering how busy our branches were throughout 2013, with the majority of properties that came onto the market with Featherstone Leigh selling within less than two weeks” says Robert Leigh, managing director. “The 2014 property market looks set to be at least as good as last year and probably better, with stock levels remaining low and premium prices being achieved. We have already seen exceptionally high levels of purchaser registrations across all our 13 offices since the beginning of the year, proving that there is no sign of any letting up in demand for quality property across south-west London”. He is marketing an elegant and substantial period family house on Ellerker Gardens, one of Richmond Hill’s finest roads. This three storey property has two large reception rooms with high ceilings, five bedrooms and a pretty garden. The house is for sale for £2.35 million. In Richmond, Savills reports that demand for properties was racing last year, putting it firmly among the best performing house markets of 2013, with a price growth of 7.9%. “The forecast for the year ahead is also healthy with 6% price growth predicted, and a rise of 22.7% forecast by 2017. International buyers have already become more prevalent in the £2 million plus price bracket, yet properties in Richmond remain predominately primary residences, with over half our buyers upsizing in the area” says Matthew Thompson of Savills. The agent is selling a fabulous family home on Richmond Hill, which has been stunningly refurbished with a large double reception room, inner courtyard, kitchen/dining area with bi-folding doors leading onto the garden and five bedrooms. The house, which has lovely period features and wooden floors, is for sale for £1.95 million. And property is also proving to be very popular in north Kingston and Surbiton. “The biggest surprise of 2013 was the increased demand for property in the Grove area of KT1, which sits between North Kingston and Surbiton” says Jasper Colliver of Hamptons’ Kingston office. “Considered more affordable than neighbouring towns, here you can acquire a pretty two bedroom Victorian cottage for around the £500,000 mark right through to large double fronted Victorian houses situated on a substantial plot for circa £1.5 million”. He is selling a lovely period three bedroom semi-detached home in The Grove, which has been finished to a very good standard, for £749,950. Luxury developers Octagon and Millgate have a similarly upbeat view of what 2014 holds in store. “Last year proved to be another highly successful 12 month period for Octagon, when we experienced some record breaking moments, including the sale off-plan of one of our super mansions on the St George’s Hill Estate in Weybridge for circa £16 million, swiftly followed by a flurry of activity at our two flagship developments in Esher and Kingswood. Our Bespoke division has also shown steady growth” says David Smith, group head of marketing for Octagon. “This year, we have already started in a much more upbeat mood, bolstered by the first glimmers of economic recovery, combined with renewed confidence in the UK property market. 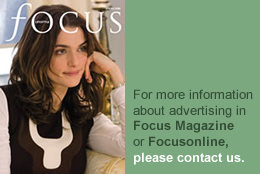 We expect the luxury house building sector to remain robust throughout 2014, particularly in the prime locations where we will be launching developments and several of our one off mansions”. 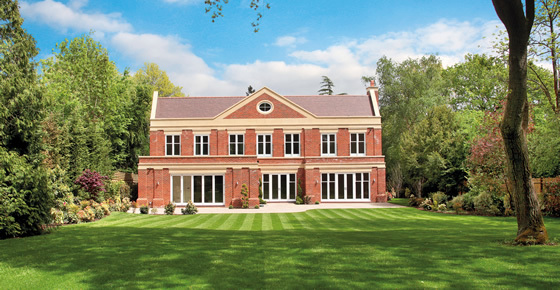 As well as Octagon’s recently completed detached family house on The Crown Estate in Oxshott, the developer has a number of show stoppers including two substantial family homes on the Wentworth Estate in Virginia Water and the March showhouse launch at its development in Royal Windsor, where each of the five bedroom houses has roof terrace views of the Great Park and Castle. 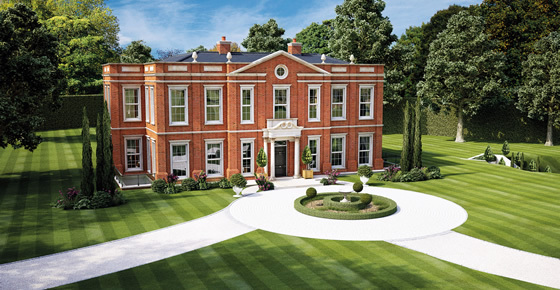 For those seeking a new house in one of the country’s most exclusive residential areas, there is little to beat The Crown Estate in Oxshott, Surrey, the location for Octagon’s recently completed detached home, Waldene. The property has six bedrooms, six bathrooms, elegant dining and drawing rooms, study, media room and large kitchen/breakfast/family room. The property is set in a three quarter acre plot with a west facing landscaped garden and is for sale through Knight Frank, Cobham and Sotheby’s International Realty for £4.75 million. 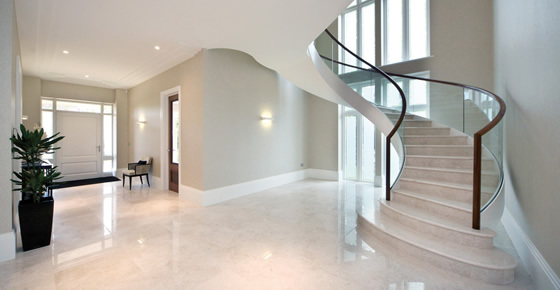 Entrance hall in Octagon’s, Waldene in Oxshott, Surrey..
Crossacres, on the Wentworth Estate in Virginia Water, is a five bedroom house on three floors set in 2.3 acres of beautiful landscaped grounds. The property has three reception rooms, study and large kitchen/breakfast room; a leisure complex on the lower ground floor with cinema/games room, two bedroom staff accommodation, lift to all floors and integral garage for four cars. Octagon is selling this stunning house for £17.5 million. Westbrook House in Ascot is a development of 14 two and three bedroom luxury apartments on the site of a former home of Rita Hayworth.The apartments, which range from 1,380 square feet to over 3000 square feet, are designed with large terraces and balconies, looking towards the racecourse. The development has secure underground parking with spaces for two cars per apartment. The properties are for sale with guide prices from £795,000 to £1.6 million through Edwards & Elliott.